All About Negril Jamaica...the Capital of Casual! Negril is located on the westernmost tip of Jamaica. This "Capital of Causal" offers two holidays in one! Negril is beautiful white sand beaches, crystal clear turquoise seas, dramatic cliffs and Technicolor sunsets....paradise. The world famous 7 mile white sand beach is dotted with hotels, resorts, restaurants, bars, beach clubs offering live music, shops, vendors and water sport kiosks. The approx. first 4 miles of white sand beach, closest to the small town centre and the larger craft market, is where most of the non all inclusive resorts are located. These resorts, in all price categories are more intimate , with most under 50 rooms ( boutique, 4 star or more and more economical hotels). The "open beach" allows couples, families, singles and groups, a taste of the real Negril , as you can walk the beach, stop in at independent restaurants, bars, other resorts, beach clubs, and eat and drink or listen to music day or night. As a former "hippy destination" now grown up, Negril still has an ire vibe feel. Shorts, bathing suits and sandals are the outfit of choice. The beach continues on from the "open beach" and this is where the larger all -inclusive resorts with all the bells and whistles ( in all price categories) begin. This continuation of the beach going towards Montego Bay includes Bloody Bay ( still the same white sand beach). If you choose an all-inclusive vacation in this area, you can still visit the main open beach with a short taxi ride. The main beach road then goes into town via the roundabout , where banks, local restaurants, shops, hardware stores etc , serve locals and visitors alike. The cliff road winds past resorts, hotels, restaurants, bars, shops and vendors, all the way to the famous Rick's Cafe, Negril Lighthouse and beyond. The cliff side features private coves and hidden caves for snorkeling. Cliff side resorts include boutique properties, both high end and more modest. You can snorkel right off the cliffs at your resort. There are also resorts and venues with live music and a multitude of place to eat and drink are withing walking distance. Shops offer groceries, alcohol, souvenirs and anything you might need. This end of Negril tends to be the quieter side. Many visitors split their stay between beach and cliff. From either side ...a short taxi ride allows you to explore all Negril has to offer. Some visitors prefer to know the bottom line for their vacation, like to relax with food and drinks taken care of, or expect total pampering with all the bells and whistles including multiple restaurant, bars, daily actives, nightly entertainment, land and water sports included, butler or concierge service or something in between. Negril has it all. 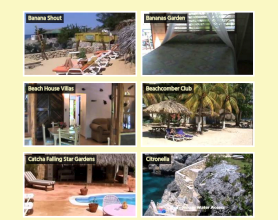 You will find more villas in Montego Bay and Ocho Rios but Negril does have some, both beach and cliff side....from casual and comfortable to 5 star. Negril is blessed with a variety of restaurants for every budget and palate. You can now enjoy cliff and beach restaurants featuring Italian, Chinese, Thai, Japanese, International, American, Fusion, Vegetarian, Jerk- spicy chicken and pork cooked over coals, Jamaican, Seafood and amazing combinations. Beach vendors sell fresh fruits, pastries, fresh fruit juice, cooked lobster in season, dried coconut, ice cream, Jamaican patties etc...and they come to your beach chair! Cliff side you will hear the whistle of fresh roasted peanut sellers walking the road, ice cream & fruit vendors and cliff side restaurants feature the best sunsets. Negril is known for its music! Jamaican musicians offer live music that will have you moving...Roots Reggae, Ska, Dance Hall, R & B, Jazz, Blues and Mento Bands. You will be dancing and grooving on the beach under the stars. Multiple beach and cliff locations offer live music...afternoons or evenings at many venues in high season but still available year round. Negril also has a nightclub for night owls. At most venues there is no cover charge. High season brings international headliners to Negril and there is a charge, but you'll be up close and personal for a fraction of what is cost to see these same headliners back home. Scuba diving, snorkeling, Para sailing, Catamaran Cruises, cliff jumping, horseback ridding, paddle board, kayaks, sunfish sailing, deep sea fishing, Yacht charters, Pub Crawls are just some of the many activities offered. Close to Negril find zip lines, ATV tours, Jeep Safaris , golf and even a Blue Hole to explore. Negril is close to many adventures and you can do them all on day trips...check out our Tours page. Negril is not a shopping destination per se but you must pick up a memento or two. Craft markets and vendors sell carved wood objects, paintings by talented local artists are a popular take home and of course Jamaica's famous Blue Mt. Coffee, Rum or Rum products . Vendors sell colourful sarongs, woven hats and baskets, T-shirts, bathing suits, Cuban cigars and lots more. Time Square offers duty free shopping for electronics and exquisite jewellery. Negril has a Scotia Bank and you can find many ATM's. You can also exchange currencies at Cambios, located on the beach road or cliff side ,which are official money exchange dispensaries. Most resorts will exchange currencies but at a slightly higher rate (as they then have to do a bank run) but if you can't move from your sun chair, its sometimes worth it. Its best to fly into Sangster International Airport in Montego Bay. Negril is about 1.5 hours driving time on a two lane coastal highway passing small towns and picturesque country side. Most airlines now fly into Montego Bay with many having multiple daily arrivals. You can rent a car if you are at least 21 yrs old ( book in advance) through many rental companies located at the airport. You can book a vehicle rental though Island Car Rental ( the largest in Jamaica) on this site. Do remember they drive on the left in Jamaica. We strongly suggest not driving to your destination at night, as not all highways are in perfect shape or well lit. Most folks prefer transfer to Negril by Transfer Companies, taxi or tourist bus (JUTA) so you can relax and leave the driving to local experts. Please check out our preferred Malcolm Brothers Transfers and Tours....they offer great rates, expert friendly drivers and ALL TRANSFERS ARE PRIVATE! As they are private, your driver can make short stops, should you wish to exchange currencies, get cold drinks or snacks or pick up anything to take to your resort. Check out our video of Negril above. We recommend viewing it in full screen!